For as long as I can remember, I’ve loved sunflowers. I’ve gone out of my way to find them. I planned our wedding around sunflowers. The flowers came first, and then the dresses. My first college apartment was decorated in sunflowers, so imagine my excitement when I discovered that an entire sunflower maze existed just a short drive from Champaign-Urbana. Our family decided to trek down to Paris last July to L&A Family Farms for a day that I surely won’t forget. Paris is located roughly an hour southeast of C-U, near Illinois Route 1. L&A Family Farms, at 21661 Staley Road, consists of approximately 1,100 acres on which corn, soybeans, sunflowers, hay, and other vegetables; livestock are raised and harvested. The idea of the sunflower maze was born in 2015 when the farm planted a few acres of sunflowers to be used for bird seed. Due to the beauty of the blooming season, they conceived the idea of a sunflower maze. The maze path changes yearly. Last year, the family celebrated their grandma’s 100th birthday and the aerial view of the maze offered special birthday wishes to her. When you arrive, parking is available at the “on farm” store. The store has fresh meat, seasonal produce and other products. We especially liked the cut sunflowers and came home with a beautiful bouquet of flowers. There were also bottled drinks and snacks available. At the store, a tractor and trailer are available to take patrons on a short drive to the entrance of the sunflower maze. Patrons are also able to walk through some nature paths in order to get to the starting point of the maze; however, our girls thought that it was fun to ride on the tractor trailer. It was hot and sunny on the day we went, and the field was dry and dusty. Visitors should monitor weather conditions as the path is influenced by rain and drought; closed toed shoes are recommended. The flowers were absolutely beautiful and photographed very nicely. Our girls were hot during the navigation of the maze so we were happy that we brought drinks and snacks for them to have during the activity. It was a fun family activity to work together to find our way out of the maze. Dead ends in the maze became unique photo opportunities. We spent roughly an hour in the maze navigating our way out and also stopping for several pictures along the way. If you’ve ever wanted to take your pictures by a large sunflower field, the farm offers a professional photographer for $50. This must be reserved with the farm in order to secure a reservation. Participants choosing to have their pictures taken at the field by the photographer are able to park closer to the maze and are given access to sections of the maze that are not open to the general public. The photography fee includes entrance into the maze. For the 2018 season, the first crop of sunflowers was planted in mid-May. The flowers take approximately 60 days to bloom, making the maze opening around the second week of July. 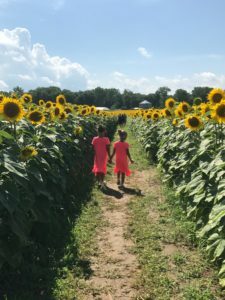 They are hoping to plant sections of the maze over time to extend the sunflower maze’s season through most of the month of July and into August. We are excited to plan our return visit this summer! Admission: $5 per person, children under 5 are free. What to bring: A camera, sunscreen, bug spray, and a water bottle and snacks. When to go: Due to the short blooming season, pay close attention to the farm’s social media accounts (Facebook, Instagram, Twitter) in order to plan your visit. In case of inclement weather, the maze is closed. General considerations: Pets are not allowed unless they are service animals. If you or your children are allergic to bee stings, pay close attention to the fields as bees are often present while the flowers are in bloom. For more information, email or Facebook.